MSGViewer quickly opens Outlook .msg email files and extracts file attachments. 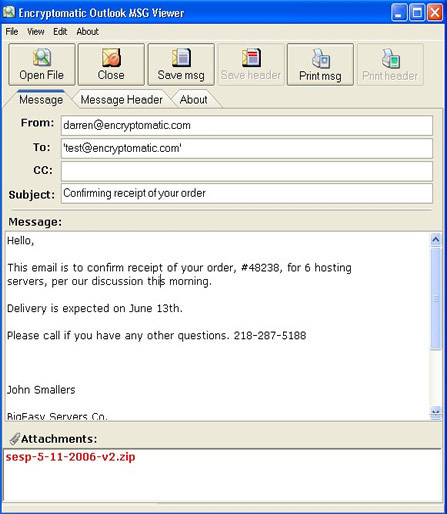 Encryptomatic's MSGViewer provides quick access to Microsoft Outlook .msg email files. View and print email messages without Outlook. Also will extract file attachments from the .msg message file. Very simple to use. Can easily be set to be the default handler for .msg files, allow you to simply click on the .msg file and immediately view it in the MSGViewer. Outlook MSG File Viewer and Attachment E MSGViewer quickly opens Outlook .msg email files and extracts file attachments.